Redberth Bed and Breakfasts. Compare latest rates and Live availability for all your favourite places and places you have always wanted to go using our new My Shortlist feature. Click + to add to your Shortlist. Bed and Breakfasts in Redberth, Pembrokeshire for 1 night from Sun Apr 21, 2019 to Mon Apr 22, 2019 within 10 miles, in an Average Nightly price range of £1 to £200. Located in Saundersfoot, Sunnyglen Holiday Park offers accommodation with a kitchenette. Fitted with a terrace, the units feature a flat-screen TV and a private bathroom with shower. There is a seating and/or dining area in some units. The holiday home offers a barbecue. Guests have full, free use of the facilities at Sunnyvale Holiday park which is just 200 yards up the road. This includes the clubhouse with evening entertainment, an indoor heated pool, children's play area and a games room. A garden and a terrace are offered at the property. Tenby is 5 km from Sunnyglen Holiday Park. Greenhills Hotel is located 3.2 km from Tenby. This 20-bedroom hotel offers an outdoor swimming pool. Free parking is provided. Each bedroom features a flat-screen TV, tea/coffee making facilities, a hairdryer and ironing facilities. Guests can relax in the garden, terrace area and bar, which features a pool table. Other facilities offered at the property include 3 guest lounges and a restaurant. The hotel is 1.1 km from Carew Castle, 3.2 km from Tenby and 3.8 km from Manorbier Castle. Cardiff Airport is 49 km away. Situated in acres of scenic grounds next to a medieval Bishop's palace, The Lamphey Court Hotel is a 19th century Georgian mansion which has a luxury spa, all-weather tennis courts and stylish rooms with views over Pembrokeshire National Park. All rooms have a private bathroom and come with a TV, and some rooms have parkland views. Free on-site parking is available, and free Wi-Fi is also accessible throughout the hotel. The candlelit Georgian Restaurant offers fresh and creative dining, whilst the informal Conservatory Restaurant serves lighter meals and provides al fresco dining in the summer. Lamphey Court features a 14-metre indoor pool and a state-of-the-art fitness suite. Guests can relax in the herbal sauna, aromatic steam room or spa bath, and a range of indulgent treatments are available. Oakwood Theme Park is just 15 minutes' drive away, and Manor House Wildlife Park is just a 10-minute drive. Carew and Pembroke Castle are both just 10 minutes' drive away. Overlooking Narberth and the Preseli Mountains, The Grove is a luxurious 18th-century country house surrounded by meadows. This privately owned 'Restaurant with Rooms' has won recent National awards as the â€˜Best place to eat and stay in Wales'. Bedrooms at The Grove are beautifully decorated with ornate fireplaces and modern art. The large bathrooms feature deep iron baths, under-floor heating and designer toiletries. All rooms include a flat-screen TV and free wired internet. In-room massages are available on request. The property offers two dining options. The Fernery restaurant offers an intimate dining experience offering a 3 course a la carte or eight course tasting menu option. The Artisan Rooms is a more relaxed dining experience and the menu has been inspired by the best of Welsh ingredients, expect grazing boards of Welsh charcuterie, artisan cheese, Welsh lamb and beef, and Pembrokeshire landed fish. The hotel has stunning gardens for guests to explore and Pembrokeshire National Park is just 5 minutes' drive away. Free parking is available at the hotel. Set 1 mile from the tranquil village of Lamphey in Pembrokeshire, North Down Farm offers B&B accommodation with free parking and uninterrupted views of the countryside. Pembroke is less than 5 minutes' drive from the property. Spacious double bedrooms feature a flat-screen TV with DVD player, tea/coffee making facilities, and an en-suite bath or shower room. The rooms also have lovely views over the gardens and countryside. The buffet style, continental breakfast includes cereals, toast, fruit juice and hot drinks. Guests can find restaurants, shops, and 1 pub in Lamphey. Open to the public and less than 2 miles from the property, the medieval Pembroke Castle offers exhibitions and guided tours. Featuring a golf course, the fishing village of Pembroke Dock is 10 minutes' drive away. Welcome to North Down Farm Bed and Breakfast a lovingly restored Georgian house in the heart of South Pembrokeshire with stunning views and close to the historic town of Pembroke and its impressive castle and the world renowned Pembrokeshire Coast National Park and its stunning beaches and coastal walks. br / br / br / br / Our superior double rooms have king sized beds and en-suite bathrooms our classic double has a king size bed and en-suite shower room and our standard room has a double bed and en-suite shower room. All have TV/DVD tea and coffee making facilities with local Welsh cakes. All rooms have either countryside or garden views. br / br / br / br / We use the highest quality professionally laundered hotel standard bed linen and towels. br / br / br / br / Included in the price of your room is a generous self -serve continental style breakfast including a wide range of cereals fruit croissants and pastries Welsh yogurts toast fruit juices tea and real coffee. br / br / br / br / There is a wide range of maps and guides which guests are welcome to borrow during their stay. br / br / br / br / A warm welcome is assured from your host Tessa who has a wealth of knowledge about Pembrokeshire and the National Park. North Down Bed and Breakfast is set on a south facing slope in the heart of the Pembrokeshire countryside. It is very peaceful here yet you are close to the historic town of Pembroke and the coast and beaches. Once a medieval coaching inn, this hotel is located less than 10 minutes' walk from Pembroke's impressive castle, along the quaint high street. The Coach House Hotel offers free private parking and free Wi-Fi access. English food is served in the wooden-floored, stylish restaurant and there is an on-site bar. Scenic walks can be around the Mill Pond, which is accessible from the bottom of The Coach House Hotel's lovely garden. There are beautiful beaches within 20 minutes' drive of this hotel, including Broad Haven South's beach in the Pembrokeshire Coast National Park. The contemporary rooms have wooden furnishings, as well as a TV with a DVD player and tea and coffee making facilities. All rooms also have an en suite bathroom with a hairdryer. Nestled in the picturesque Welsh countryside, the 5-star Gold award-winning Canaston Oaks is a luxury boutique B&B with uninterrupted views. Oakwood Theme Park, with its many rides and attractions, is less than 1 mile from the property. The luxurious rooms at Canaston Oaks boast elegant furniture and fine dÃ©cor. Each room has a flat-screen TV, an en suite bathroom, an iPod docking station, and free Wi-Fi. Some rooms have a marble-tiled bathroom or a stylish Jacuzzi bathtub. Guests can enjoy the tranquil surroundings, a private patio with seating area, and far-reaching views. One of the rooms also features a fully fitted kitchen. Breakfast at Canaston Oaks includes the traditional full English. All food is cooked to order and is made of locally sourced ingredients. The rural Pembrokeshire offers many outdoor activities such as mountain biking, bird watching and fishing. The Pembrokeshire coast is 20 minutes' drive away. 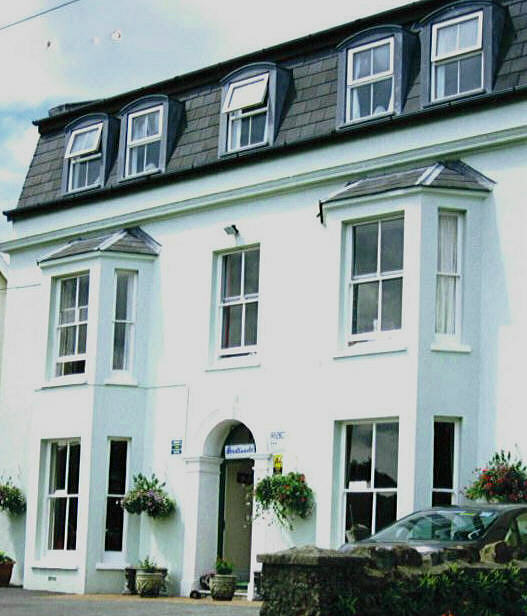 The Middlegate Hotel is located in the center of Pembroke's main street, close to Mill Pond and a 10-minute walk from the railway station. This traditional hotel has onsite a restaurant, cafe, bar and live music/ function room. All of the rooms at The Middlegate Hotel are en-suite, they include digital TV, Free WiFi, tea/coffee making facilities and a private bathroom. Free WiFi is also available in public areas. The hotel also features a terrace, children's play area and a garden, as well as free on-site secure parking. Pembroke Castle is a 5-minute walk from the hotel, while the coast is less than 4 miles away, with regular shuttle buses running daily. Pembroke dock is a 10-minute drive away and from here you can catch a ferry to Rosslare, Ireland. Located in Narberth, in a building dating from 18th century, Ty Waldo features a garden and guestrooms with free WiFi. The property is around 8 km from Oakwood Theme Park and 2.7 km from Llawhaden Castle. The property has a restaurant. All units in the guest house are equipped with a kettle. Rooms come with a private bathroom fitted with a shower and free toiletries, while some rooms are equipped with a kitchenette. Guests at Ty Waldo can enjoy a continental breakfast. The accommodation offers a sun terrace. A selection of activities are offered in the area, such as cycling and hiking. Boasting free WiFi access, Albion House is situated just under 3 miles away from the beautiful town of Pembroke and a 5-minute walk from the ferry port offering connections to Ireland. A 5-minute drive from Pembroke Castle, the centre of Pembroke Dock is also just 6-minute walk away. The individually designed apartments and rooms benefit from a TV, with some units including a well-equipped kitchen complete with an oven, refrigerator and dining area. All of the rooms include an en suite bathroom, with towels and linen included. There is a laundrette available that can be used with coins, in a communal area. Guests can enjoy the coastal paths, with the Pembrokeshire Coast National Park a 22-minute drive away. Haverfordwest and Tenby can be reached within a 25-minute drive. Further inland, local attractions such as Oakwood Theme Park and Folly Farm are both 12 miles from Albion House. Around 10 minutes' walk from Pembroke Dock Ferry Terminal, Lakeland Guest House looks out over the Pembrokeshire hills towards the River Cleddau. Adjacent to Pembrokeshire Golf Club, this guest house offers a full English breakfast, free Wi-Fi and parking. Rooms have a flat-screen TV and tea and coffee facilities, as well as a microwave and fridge. Each has a private or en suite bathroom with shower. Full English breakfast is served each morning. Lakeland Guest House is a 7-minute drive from Pembroke Castle, and the nearby ferry terminal operates services to Rosslare in Ireland. Milford Haven and Haverfordwest are a 20-25 minute drive from the town.